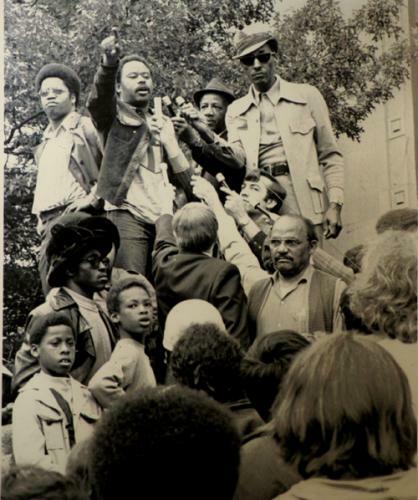 In 1969, Walter Hundley, director of the Seattle Model Cities Program, encouraged local black independent contractors to organize in an effort to gain lucrative building construction contracts that required minority participation. When the contractors responded, they selected Tyree Scott, an electrician, as their leader. They also called themselves the Central Contractors Association (CCA). The CCA defined itself as an outgrowth of many participating individual and organizations participating in Seattle’s Model Cities Program and characterized itself as a organization seeking equal compliance in contracts granted on Federal building projects. The CCA Board included five diversified members. Luene Curry owned Washington Drywall and Paint; and James Takisaki owned Takisaki Construction Company. Along with Scott (who was Board President) they had the direct experience as construction workers. The fourth board member, Lembhard Howell, was an attorney while the fifth member, Benjamin F. McAdoo was an architect. When Seattle, Washington area construction firms and labor unions continued to deny work opportunities to CCA members despite civil rights legislation that banned such discrimination, the organization initiated a series of direct-action dramatic protests between 1969 to 1970. During this period the CCA protests shut down construction of several major work sites in the greater Seattle area, including a swimming pool project at Garfield High School, the King County Courthouse Construction site, the Harborview Medical Center’s Research Facility site and the Firehouse at 13th and Pine site. The CCA’s most dramatic demonstration occurred when 100 demonstrators halted air traffic by walking onto runways at the Sea-Tac Airport to prevent planes from taking off or landing. The CCA also shut down 25 construction sites at the University of Washington. In addition to direct action protests, the CCA launched a lawsuit against five prominent unions in Seattle. In December, 1969, the U.S. Department of Justice joined the case in favor of the CCA. The subsequent ruling handed down by Federal Judge William Lindberg found all unions except one in violation of Title VII of the Civil Rights Act of 1964. The court required unions to open membership to African Americans, create a special apprenticeship program, change the admissions for journeymen level, and immediately admit 45 African Americans to the program. After this victory, Scott Tyree left the CCA to found the United Construction Workers Association (UCWA) in 1970. After his departure, the CCA decreased their emphasis on direct action and shifted its resources to helping provide training and support for black contractors who now had access to government contracts. “A Letter to the Clergy of the Greater Seattle Area,” in file Materials Distributed by Various Groups at 12/14/69 Meeting, Location VF0643, Accession # 1346-001, Collection Name Central Contractors Association, Archival Materials, University of Washington Special Collections; Quintard Taylor, The Forging of a Black Community: Seattle’s Central District form 1870 through the Civil Rights Era (Seattle: University of Washington Press, 1994); William A. Little, “Community Organization and Leadership: A Case Study in Minority Workers in Seattle,” (Ph.D. dissertation, University of Washington, 1976).